Want Motorcycle Stickers? Get them Here! The first Rolling Thunder®, Inc demonstration in 1988 was the byproduct of two Vietnam veterans who felt that not enough attention had been given to the POW/MIA’s who did not escape the war with their lives or their freedoms. Vets Artie Muller and Ray Manzo, felt that government and mainstream press had ignored intelligence reports citing that more than 10,000 Americans had still been living as Prisoners of War or classified as Missing in Action. After expressing their concern to fellow vets, family and friends, roughly 2,500 motorcyclists converged on Washington, DC on Memorial Day weekend. That first year’s arrival would be announced by the thunderous roar of their motorcycles, a sound reminiscent of the 1965 bombing campaign against North Vietnam know as Operation Rolling Thunder. Hence, the name of Rolling Thunder ®, Inc was born. Now one of the largest, most meaningful gatherings of motorcycle enthusiasts in the U.S, Rolling Thunder boasts an attendance of about 500,000. 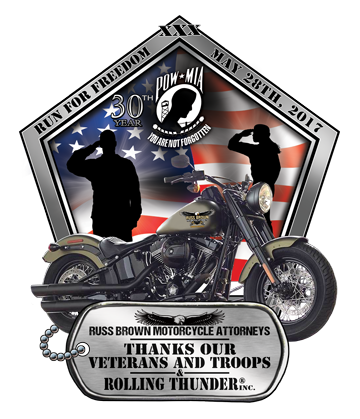 Russ Brown Motorcycle Attorneys has been a major sponsor of the Rolling Thunder®, Inc for the past 5 years and is grateful to be the only attorneys to have a sponsor booth in the heart of the Pentagon parking lot. You can also find our booth on Thunder Alley which is the official vendor site for the annual run. Help us honor our vets, show your support with your very own Rolling Thunder® commemorative sticker today! One of our popular stickers given out at our booths during various events throughout the nation, now available online here! To show our appreciation and gratitude, Russ Brown Motorcycle Attorneys offer commemorative stickers dedicated those who have served our country. Like many Americans, we have the utmost appreciation and gratitude for members of the armed forces who have, and currently do, fight for our freedom. Veterans make up a significant part of the motorcycle community and the Rolling Thunder®, Inc Annual Run to the Wall makes that abundantly clear. Russ Brown Motorcycle Attorneys proudly support the members of armed forces and is honored to call many of them clients. Our commitment to the motorcycle community extends to our business friends too. If you are a dealer or have a retail or online shop and would like to promote or partner with RBMA, email us your contact info at supplies[@]russbrown.com. We can provide free branded supplies for use in your shop. • Enter the QUANTITY of stickers desired for each item in the box. • COMPLETE the request form page and click [ Request Stickers ]. 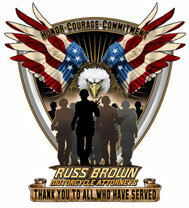 The Russ Brown Motorcycle Attorneys FREE Stickers are available to USA residents only. 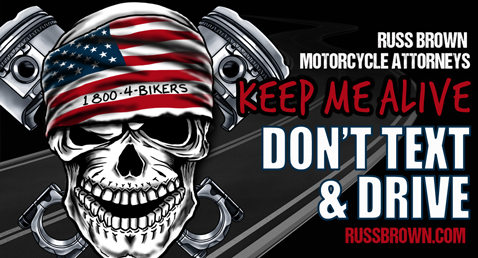 For larger amounts, please call Russ Brown Motorcycle Attorneys at 1-800-424-5377.